I would start the day where I would pick up a couple of friends around my area before heading off to the Oakland Convention center in Downtown Oakland. It is here where Krakencon would be held. I would park in the convention center parking lot since I was a little nervous leaving my car out in the open. Let’s just say Oakland has its run in with crime around the city that I just fear that my car would be broken into while I was in the convention. Although the $25 per day fee doesn’t really help either. I would head straight to the registration table which was conveniently in front of the elevators. I would grab my badge in the VIP section of the table by showing the email that was given to me when registering for Press. It was there where I decided to wander around the convention and right from the start, it looks a whole lot different. For this year’s con, they decided to take all of the East and West Hall of the convention center to make the con more spacious than what I saw when I last visited in Spring 2014. The huge West Hall had Dealer’s Hall and Artist Alley while the West hall had the autographs and Gaming Area inside. I would continue to look around the area of Krakencon a little bit later, but first I had to check out a panel that Krakencon was holding. 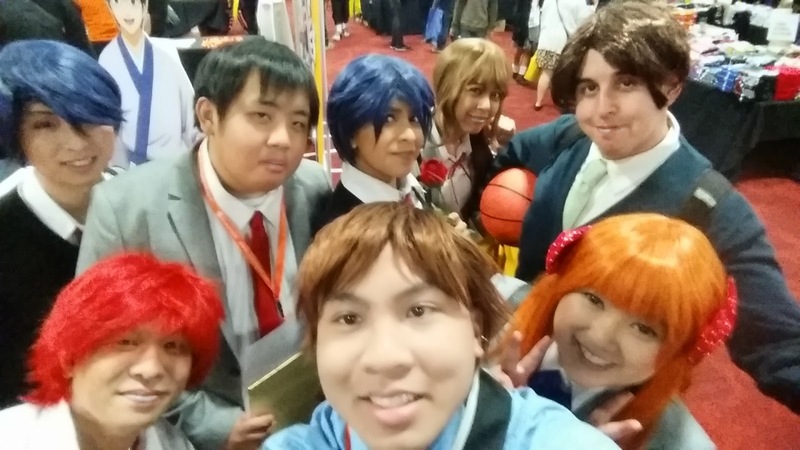 Me and our Monthly-Girls' Nozaki Kun group! It was the VIZ Media industry panel where a representative of the company would come in to talk about the mangas and Animes that they will be distributing to all of the anime fans out there. The panel would take place in the Main Events room which was in the Gaming Hall. I would arrive to see mostly an empty room with only a little amount of attendees hearing about Viz Media’s lineup for Animes and mangas. The representative would start off with the manga section of the company as they announced new release dates for notable mangas that fans will enjoy: Notables include Tokyo Ghoul, Fragments of Horror, and The Legend of Zelda (full color comic). More details of these mangas to be announced. They even promoted Weekly Shonen Jump which gives users the newest chapters from Shonen Jump mangas once they get released from Japan. And yes they are translated to English. For just $26.99 a year, you can catch up on the latest manga chapters of mangas like One Piece, Bleach, Food Wars!, Nisekoi, and a whole lot more! No lie though if you are a fan of Shonen Manga, this is a deal you should consider! The panel then switches to Neon Alley which is the channel for all of Viz Media’s anime lineup. They currently are showing their shows on Hulu and Viz.com. Some shows that they focused on include Gargantia (all episodes including OVAs are out on Neon Alley), Naruto, Death Note (Full series DVD coming out soon), Ranma ½ (New Blu Ray sets coming soon), Copellion, and most importantly, Sailor Moon. The anime section showcased mostly about Sailor Moon including release dates for DVD/Blu-Ray sets of Sailor Moon R, the second season of the series. And of course Sailor Moon Crystal, the remake of the original series which now has a dub that will debut at Anime Expo 2015! The voice actors of the redub of the original Sailor Moon series will reprise their roles in the remake as well! The panel ended with a showing of a clip from Sailor Moon R where Rei would perform as an idol. The clip was dubbed so we were able to hear Christina Vee who is the English Voice Actress for Rei in the series dub and hear her talented singing from the clip. 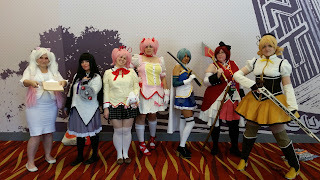 Once the panel ended, I would meet up with my cosplay group that I was a part of for most of the day at the con. I was cosplaying Hori Masayuki from the show, Monthly Girls’ Nozaki-Kun, with the group that I cosplayed with back at AOD. Only this time, we were able to have a Nozaki and a Kashima as well. In fact, there were a notable amount of Kashimas that I had to scream alot (Only those that watch the show would understand). Once we got the group together, we wandered around the convention and saw what the convention had to offer. We would roam around Dealer’s Hall and saw what the dealers was selling. We even went through what I would call “Conventions Aisle” where conventions (mostly around California) would promote their upcoming conventions. Some even gave away items from their previous year. For Example, PMX (Pacific Media Expo) was there doing raffles and even had a japanese prize game where you spin a crane and hope for a golden ball to come out. I would play it once but couldn’t grab a golden ball. But my friend actually did and he grab idol CDs, Weiss Schwarz Promos, and even rang a bell as loud and long as he can. Sacanime would be there and would have a prize wheel where the big prize would be a ticket to their maid cafe. I would try it out but ended up with a poster, a My Little Pony and Attack on Titan crossover. Yeah, I wasn’t proud of this prize to be honest. Some industry tables were around the West Hall as well. Crunchyroll would be there to have their Livestream and our group would be there to showcase for the viewers. Our group would give us many questions, especially our Chiyo which she was glad to answer to the viewers of the livestream. I was able to grab a poster from them since I was a premium member of theirs and I would end up with a Your Lie in April poster since it was the only one they had there that I watched. It kind of hurts me that I grabbed it because... well you have to see the show to know why I felt that way. What was also there was a Planetarium from the Chabot Space and Science center but it looked pretty small and it was inflatable. We didn’t really bother in going in but the fact that the center was helping to promote Krakencon kind of shows they have got good support from around the area. Next to it was a photo booth where we would take advantage of the spot and took photos of our cosplay group. Then there was the maid cafe and right next to that was Rock Band! They had all the instruments set up so that you can play as long as you sign up. We would try to sign up but it was already too late in the day when we decided to play. Apparently it was a very long queue to play the very popular gaming franchise. Right after we roamed around the West Hall, our group would look upstairs to the extension of the con where the ballroom dance and other fan panels would be held. None of the panels looked very exciting to us that we just spent the rest of our time downstairs at the West Hall again. Our group would break later on in the night since some of the members wanted to check out the ballroom dance. I wasn’t really up for it so I decided to check out the Costume Contest in the Main events room to see a lot of very good looking cosplays from the attendees of Krakencon. Afterwards, I would spend most of the night at the gaming hall since it was the only thing left open where I would play card games, even had a game of Weiss Schwarz with a couple of friends. I would then leave around 11pm still thinking about even going to 2nd day of Krakencon. But after what I experienced today, I was really urging to go for the last day. On this last day of con, I would not be in cosplay and just mostly chill for this 2nd day of con. I would arrive the con around 11AM where we just mostly hanged around the West Hall and Gaming Hall for most of the day. I would meet up with my friends who were tabling in both Dealer’s Hall and Artist Alley. I was able to get a chat with them and even bought artwork that was good around there. Same goes to Dealer’s Hall where I chilled in my friends’ store table for some time whenever I needed rest. I would also check out the other Dealer’s tables and bought a few things. When lunchtime hit, me and a couple of my friend artists decided to check out Chinatown where we would order at a dumpling place in that area. They had a mass order for most of the artists in the Artist Alley and they were the ones that volunteered to grab food for them. I would tag along and grabbed lunch with them as well. At around 3pm, I would head over to the autograph line to get a few things signed for Stephanie Sheh, who is a really talented voice actress and a reason why I wanted to come back. She actually was sick for the con that she lost her voice. But she was able to sign a couple of things: A Sailor Moon Crystal handout that was given to me in line (she does the voice of Usagi from the show), A K-ON! Blu-Ray cover (She was Yui in the show), and a Yui (Sword Art Online) Weiss Schwarz card. From then on, I would just chill with people around the con until 6pm when the con ended and we would all go home from there. A weekend that was pretty much fun and chill. A good time to take a break before the big con of Fanime hits a month after this. Me not in cosplay. I now become Photographer! 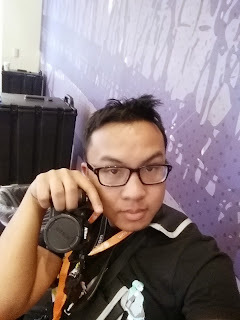 I have to reflect back to Krakencon Spring 2014 when it first went to the Oakland Convention Center to see how much has changed since then. And it has done what I expected this con to be, a whole lot better. This Spring Krakencon has changed a whole lot since last year. Now that the staff of Krakencon has access to both halls, the convention has gotten significantly bigger which means more space for new things at the con. At this year’s con, they had more space to put in more tables for industry supporters, a much bigger photo booth, and way more space for gaming hall. Now there are many monitors for gamers to play hit games as well as the usual projector for Just Dance. And don’t forget about one corner in the West Hall for just Rock Band that really got the attendees attention. Not only that but with access to the upstairs section of the convention center gave way to more events for attendees to enjoy like fan panels that attendees would love to host and watch as well as a ballroom dance that attendees love to have for a good night out at the convention. I must say that the Krakencon staff really has managed to make good use of the extra space they were given and I believe everyone including the artists and dealers managed to get around the con satisfied with the good work they’ve done. I must say I have had a pretty fun time at Krakencon. Although it has been since last spring that I visited this convention, I just see so much improvement for this con and this trend has been continuing for so long. From their first convention back at the South San Francisco Conference Center to right now, Krakencon has been a whole lot of fun! Gaming Hall was perfect this time around with many things for people to play like the usual Just Dance game since it was a hit when I was at Krakencon before. There was also more video games for people to play and more table top gaming for those who are into card games or those who want to play a fun game when spending time at the con. Although with the more space that Krakencon was able to gain access too, there are setbacks to that perk. Maybe because of the fact that there were a pretty small attendance rate to this spring Krakencon. Although when you see the date that this con was located, you can see the reason from there: The con is before Fanimecon (a month in fact). With a bigger con like Fanime, cosplayers and attendees are more looking towards attending that con more than Krakencon. Hence the reason of the low attendance rate. Maybe pushing Krakencon a little earlier or a few weeks after Fanimecon can grab the people’s attention. But I still see that Krakencon has done its best to its extent to grabbing the fan’s attention. I mean they pulled out a lot for this like bringing in a creator of a very popular animated series along with a well-known english Voice Actor that has voiced for many animated shows. That really has gotten my attention and I hope they will bring the same kind of people for the next Krakencon. Overall, Krakencon has been improving ever since its first impact. I had a great time meeting up with people and having a good time with them at this con. I had no problems when it comes to staff and events. I believe everything was ran well and I hope this trend continues on as Krakencon goes to the USS Hornet for the fall. Wait, that’s a war battleship. Uh oh, it’s Kancollecon!!!! Well sorry it took a long time but with a full time job, it really takes away a lot of free time. 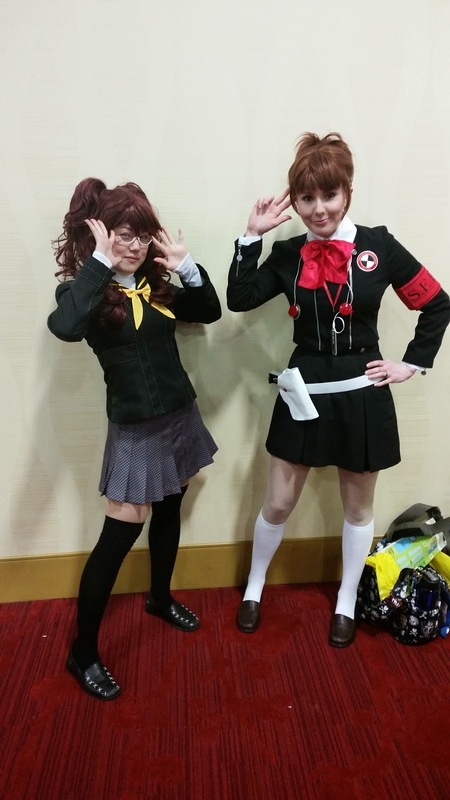 I was able to give you guys this report before the big Fanime run. And wow, it’s this weekend! I’M NOT READY!!!! Thanks for reading this report and hope to see you guys at Fanimecon 2015!